Hi Everyone! I know it’s been awhile, so I figured the one year anniversary of my completion of the Pacific Crest Trail deserved some recognition. In my next post, I’ll update everyone on my post hike life and future plans. For now, I want to share my photos from my return to the John Muir Trail at the end of this summer. 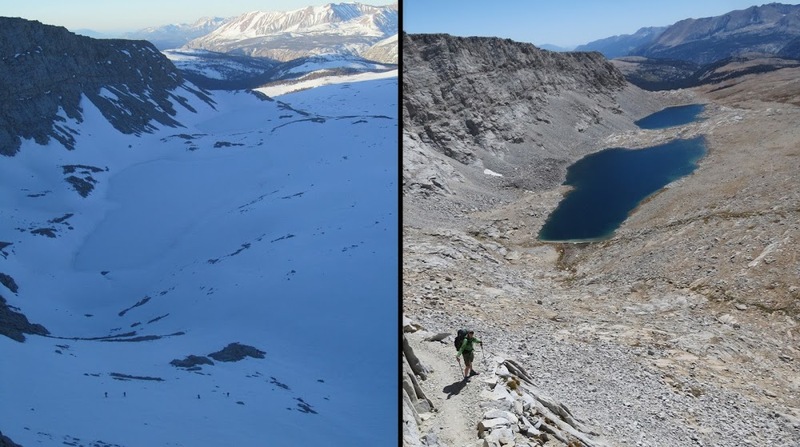 Those of you not familiar with the details of where things are, the JMT and PCT overlap for about 160mi in the area where PCTers in 2011 experienced the highest snow pack in history. With every slow and strenuous step through the snow last year, I vowed to return to the JMT to see what was under that blanket. Fellow PCT 2011 hikers, I know your mind will not be able to comprehend any of this. I still don’t believe it. I felt like a trauma victim being brought back to the scene with bouts of PTSD (Post Traumatic SNOW Disorder). Had I taken more photos last year, I’d have more to compare. As with many of us, I was too tired/scared to take more pictures last year. The crossings especially! Here is what I came up with. Enjoy! Guitar Lake from higher up on Mt. Whitney. 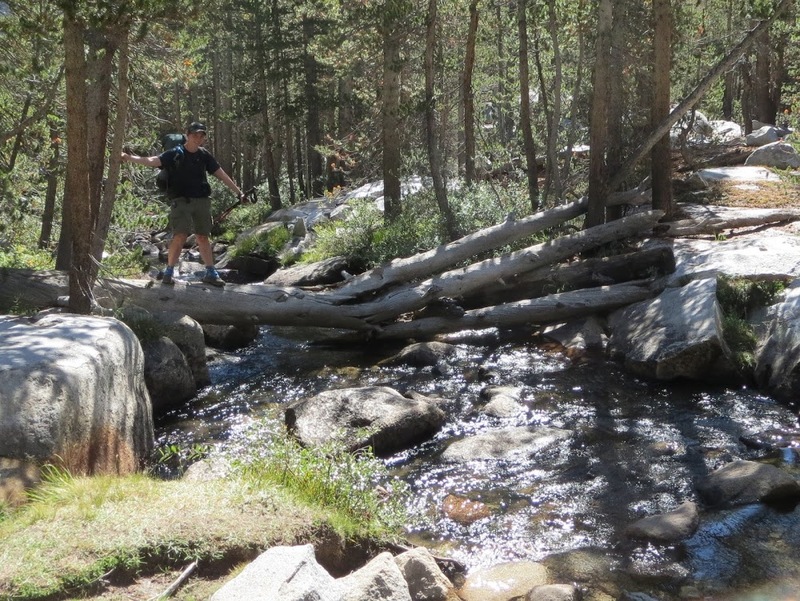 Tyndell Creek Crossing…I couldn’t even find the spot where we crossed, but here is the real crossing. Wow, that’s how deep the snow was on level ground with full sunlight on it. The south approach to Forester Pass. Notice the hiker on the left for perspective of how massive this is! The frightening snow chute we traversed on Forester Pass. Looking south from the top of Forester Pass. There are switchbacks there! Notice me on the switchback and the hikers coming up on the left. Sheesh! Looking north from Glen Pass. The south approach of Silver Pass. The south side of Mather Pass. Since the switchbacks didn’t exist, we just used ice axes and micros to climb the left side and traverse across. One of my favs. The south side of Muir Pass. We apparently approached way west of the trail, so the picture isn’t exact. Many hikers remember this traverse along Wanda Lake after Muir Pass.We didn’t know where the water ended and land began. With the space we had some chose to hike on the thin ice, ah! A branch of Bear Creek where I crawled over this angled log in fear. Not fun! dry. The actual crossing is the rock hop on the bottom. The Bear Creek crossing was my most frightening! It was higher than my waist and swift. I couldn’t keep my feet down with the current. I was too scared to take a picture, so here is one from my friend Drop-N-Roll who was hiking near me. Hikers, yes, this is the “waterfall” we hiked through after VVR. That’s Balls & Sunshine on the left. I just have no words for this! The south approach to Donahue Pass. Looking north from Donahue Pass. We were so happy to see dry land at the top of that Pass! Lyell Fork from the footbridge below Donahue Pass. Notice the snow and deeper rapids last year. Lyell Canyon on the way to Tuolumne Meadows. Notice, the trail was full of water last year. Looking up toward Donahue Pass from Lyell Canyon. The backside of Cathedral Peak. I am blown away by the photos! What an adventure. "Rockin'" talks so highly of you on her blog. Although I have not hiked more than our local mountain, I love sharing the adventures through other hikers journals! These comparisons are incredible! 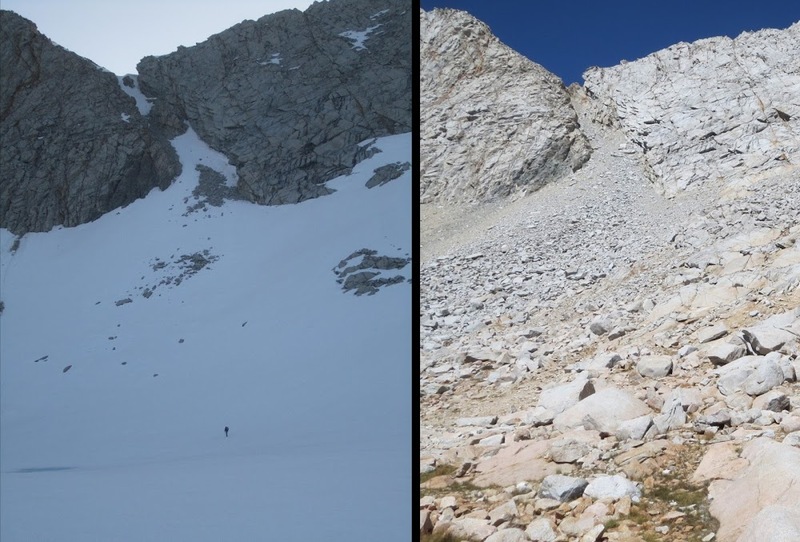 We're hiking this year 2013 (ihearttrail.wordpress.com), and hope it looks more like the pictures on the right…ice axes are still causing me anxiety 🙂 But tell me, how were the mosquitos without all the snow around? Katherine, I'm so excited for you two. That is unique that you are doing a flip flop of sorts. Why did you decide to start in Tehachapi? Just timing? I see you two are getting plenty of training with weight in already which is great. I've never see the extreme YakTrax you have. They seem to have the teeth that you need on the trail which the regular YakTrax don't have. It looks like a normal year for snow this year, so you'll have some snow at the passed with breaks of dry trail inbetween. That is ideal to me as it is just magical with the snow and glissading is fun! Good luck you two! Yay! It’s not the best one, but definitely an important part of the series. Did my hike JMT 2013 and 2014, July and August. SOBO. No comparison to your 2011 adventure. However, did a 2011 March snow camp at North Lake, Bishop with 3′ additional snow over the weekend. Hard to imagine but your photos help to appreciate the physical and emotional demands your trip. My mind is working very fast now. I just got my permit for the JMT starting from Cottonwood Lakes and booked my flights from Amsterdam (Netherlands) to California. So I will be there for sure. But this is the first realityshock I have since I read about the snowfall. Seeing this pictures is REAL! I hike solo and ….whaaahhh… do not really know what is wise! But thanks a lot for this realityshow haha! I’m in the same boat! Flying from South Africa, hiking solo, and terrified of this snow business! Whatever you choose, all the best and happy trail to you. Should be an advencha! Just be sure to have a GPS track to find the trail if you lose it in snow. Interesting, what date on the pictures ? You all really should take a basic snow survival course when you get here. This is no joke. Thanks so much for sharing all this great info. We are going SOBO JMT starting July 17 and there is more snow this year than in 11. Any tips …knee length gaiters? How much snow camping did you end up doing? thicker pad? more sunscreen ? You’ll be going in two weeks later than I was in the Tuolumne Meadows section and a lot melts in that amount of time. Also, your hike will take 2-3wks, so you should have snow only on the passes most likely. The south sides will be much clearer than the north. The water crossings will be higher than normal, but going down hopefully by the time you get to them. It will be hot once it warms up each day, so shorts were fine. Possibly the most frustrating part could be postholing up on the passes once it warms up, but the direction you’re going is better for that IMO cause I don’t like the fear of postholing AND going down on the north sides. I did that last year coming down the north side of Mather last year and didn’t love it. I like carrying an ice axe and micros, but I do wonder if you’ll need the ice axe that late. I guess you’ll need to see how fast it melts. You won’t have to worry about snow camping, but yes sunscreen under the nose and burning the roof of your open mouth can be a thing people aren’t ready for. Just know there is a lot of fear mongering and hyperbole out there. Just follow the PCT journals on the PCT website and find ones that will have gone nobo just before you entered. Many JMTers did that my year. Have fun, it’s great to see it in snow! Love these photos. Amazing stuff! !